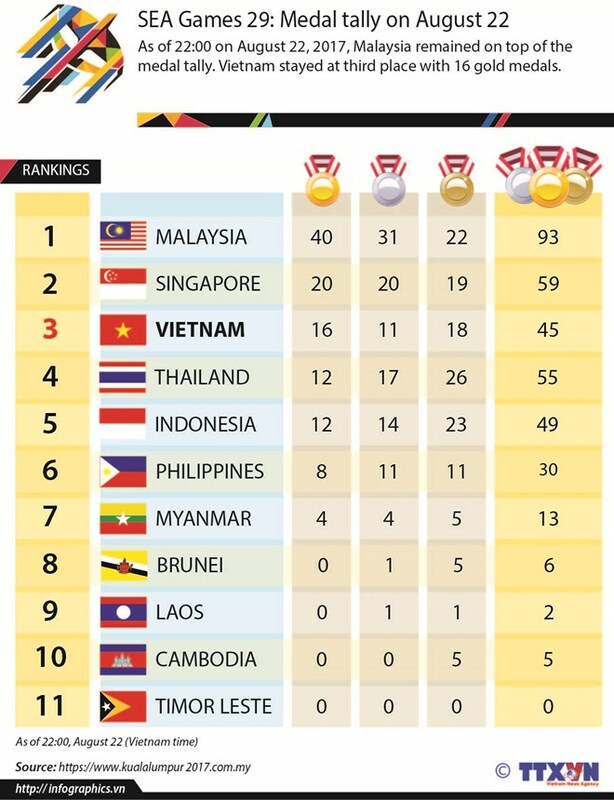 Kuala Lumpur (VNA) – Vietnam remained in third place in the medal tally of the ongoing 29th Southeast Asian (SEA) Games in Malaysia as of the end of August 22, the third official competition day. The ranking was secured after Vietnam pocketed eight gold medals in swimming, athletics, petanque, karate, gymnastics and fencing, bringing its total gold to 16. The country also won a total 11 silver and 18 bronze medals. Malaysia remained on top of the tally with 40 gold, 31 silver and 22 bronze medals, followed by Singapore (20 gold, 20 silver and 19 bronze medals). Cambodia was at the bottom of the list with 5 bronze medals, while Timor Leste was yet to seize any medal.